WSU Forester Andy Perleberg leads a land tour as part of an Extension workshop. 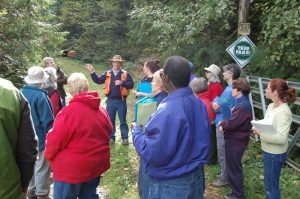 Extension helps landowners preserve and pass on their forest lands at a Dec. 14 event in Spokane. A mix of presentations, videos and practical exercises, “Ties to the Land” includes a question and answer period with an estate planning attorney specializing in farm and forestland transitions. The workshop is 8:30 a.m. to 4:30 p.m. at the Enduris Training Facility, 1610 S. Technology Blvd., near Spokane International Airport. Enrollment is limited to 30 families, and registration is on a first come, first served basis. For more information, contact Andy Perleberg, WSU Extension Forester, at (509) 667-6540 or by email at andyp@wsu.edu. See more upcoming events at the Extension Forestry website.